RESULTS: The majority of the respondents were older women having been diagnosed with diabetes for more than 5 years, with at least primary school education and of diverse South African ethnicities. The main prompting questions operationalised the term 'perception', probing their feelings, experiences and knowledge of health-related communication strategies as presented by a variety of information sources. After recording interviews, data were analysed according to themes, categories and sub-categories. CONCLUSIONS: The study highlights factors that encourage patients to seek help and foster attitudes of compliance. Practical problems regarding the management of diabetes are underlined. The role of family, as well as the patient-caregiver relationship, in the acceptance and management of the disease is revealed. Societal perception of male symptomology is shown. The study offers information to stakeholders and health care workers for continued successful management of diabetes in communities. Patients with chronic lifestyle disorders, such as diabetes mellitus, are expected to be intensely involved in the management of their condition. The World Health Organization (WHO) underscores the quintessential role people play in determining their own health and ultimately their own future regarding illness and disease (WHO 2016). The IDF ratifies this understanding towards patients' role in their own health when they state that 'patients have the right to autonomy, informed decision and to participate in their own care' (IDF 2016). Therefore, patients need to be empowered with appropriate knowledge and skills to enable them to participate fully in their own self-management. Health communication strategies are diverse and their main purpose is to stimulate and inspire patients diagnosed with diabetes in improving their decision-making and self-management related to their health. Two themes emerged from the data and these were supported by various categories and sub-categories. Direct quotations from patient interviews are presented as evidence based on the district where the interview was conducted, whether the interview was conducted in a PHC or CHC and the sequential number of the patients' interview. Self-management is the ability to care for oneself with minimal aid from external people such as health care workers (O'Donnell et al. 2017). Adaptation to health information in self-management as a theme was supported by categories, namely factors influencing the adaptation to health information in self-management and modifying my lifestyle. Although diabetes is present in a family, other family members may have a genetic predisposition and lifestyle inclination to develop the disease (Pociot & Lernmark 2016). Conversely, family support - emotional, financial and practical such as reading health information for the patient - plays an important role in patients' coping skills. Patients expressed the need to be guided towards improved health outcomes because of a variety of combined factors associated with diabetes mellitus. The initial changes associated with diabetes were not accurately interpreted by patients, thereby motivating them to seek guidance. Failure to accurately interpret physical changes associated with diabetes influences the motivation to seek health care and may be detrimental to the patient. Patients in this study relied on their own limited knowledge which often persuaded them to seek and engage with a variety of health communication strategies. The need for guidance arises at various stages of the patient's trajectory and adaptation to a chronic illness and such needs are influenced by perceived self-efficacy related to the chronic illness (Inzucchi et al. 2012). The art of communicating health information integrates various contextually appropriate concepts that support decoding and comprehension of messages conveyed (Harvey & O'Brien 2011). The frankness of some health care workers' personality, although perceived as threatening, resulted in positive outcomes. Although this may not be the case for most patients, health care workers may need to calibrate their own personality in relation to the patient at hand for the patient's maximal benefit (Stanyon et al. 2016). 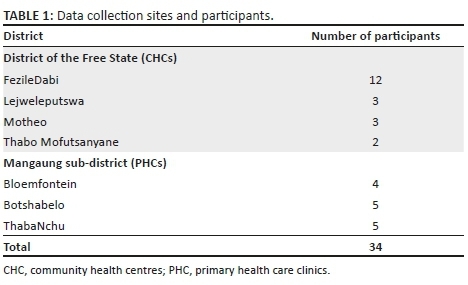 Peer support and education, although unstructured and informal, seemed to be a common technique used in transmitting health information among patients with diabetes within various communities in the Free State. Likewise, in the field of HIV management, the concept of 'expert patients' has supported health care workers in delivering health information related to adherence and self-care for other HIV-positive patients (Landes et al. 2017). Such approaches may need to be devised and strengthened in areas of high disease burdens like South Africa.